As life goes pretty hectic these days, we’ve got less and less time for activities like cooking. Some people can’t even find the time to eat properly. We need everything fast and easy, otherwise we lose interest. If you ever tried the instant mashed potatoes that can be found in supermarkets, then you surely know that’s not “the real thing”. 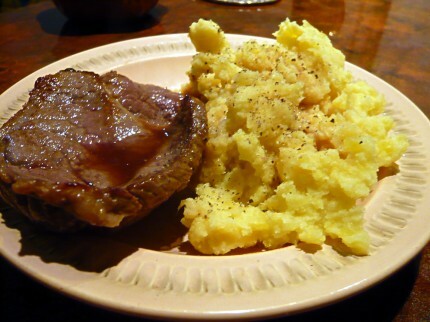 It’s a huge difference in taste between instant and homemade mashed potatoes. Believe it or not, there’s not so much difference in the cooking time needed, if you don’t take into account the boiling time. Take 5-6 medium potatoes. Make sure they are all pretty much the same size, because you want them to get cooked at the same time. Choose only healthy potatoes, with nice skin, without sprouts. Wash them very well. 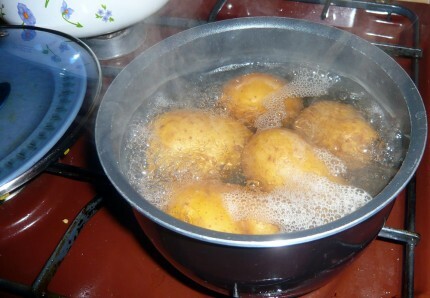 Put the potatoes in a large pot with water, add a tablespoon of salt and bring them to a boil. Cover the pot and simmer for 15-20 minutes. Check the potatoes with a fork to see if they are done. If the fork goes easily, you’re ready. Remove the pot from heat. Take the potatoes one by one, cut them in half and peel them. Beware, they are very hot, so you’ll nee to use a fork to get them out of the water. As you peel the potatoes, put them in a bowl, add 2 tablespoons of butter, some salt and optionally some freshly ground black pepper. Cover the bowl to keep it warm until you’re done with all potatoes. With a wire masher, start mashing the potatoes, gradually adding warm milk until you’re happy with the consistency of your mashed potatoes. This is one of the simplest potato recipes and it’s an awesome side dish for steaks, sausages, stews and for all meat-based dishes in general. If you’re really in a hurry, you can speed up cooking by peeling and dicing the potatoes before boiling them. 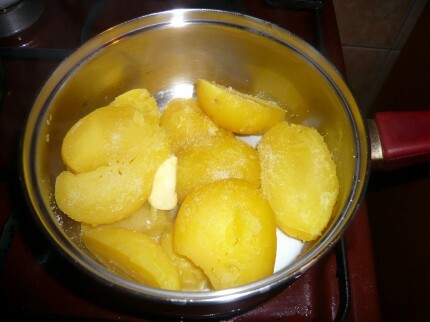 However, boiling the potatoes unpeeled results in a better taste, therefore I reckon it’s worth the pain of prolonging the preparation time a bit.